An individual is free to make one personal copy of 9Apr40: Norge angrepet! for his/her own personal use. D. my children Rebecca, Robert, Rohan, and Johanna in the hope they and all our children never have to suffer and die in another world war..
... along with my personal thanks to Unni Berge and the historians of the excellent Norwegian Armed Forces Museum in Akershus Festning/Fortress and to Lørenskog and Skedsmo libraries'/bibliotekers librarians, as well to wargamers and historians Fred Forde, Jack Greene (designer of the first Norway 1940 game, which is being revised and republished), and Eivind Vetlesen and Yngve Bækholt (the Norwegian designers of the excellent Kampen om Norge game, which has historical events/factors - and individual warship - cards to enliven play), for their advice and historical research assistance. For anyone interested , I strongly recommend you watch the videos Why We Fight: Divide and Conquer and Nazi propaganda film about invading Norway. Basic Game Rules in Rich Text Format - Use WordPad. Revised 16Oct17 - note victory condition modification for Narvik - and expect more revisions. Advanced Game Rules in Rich Text Format - Use WordPad. 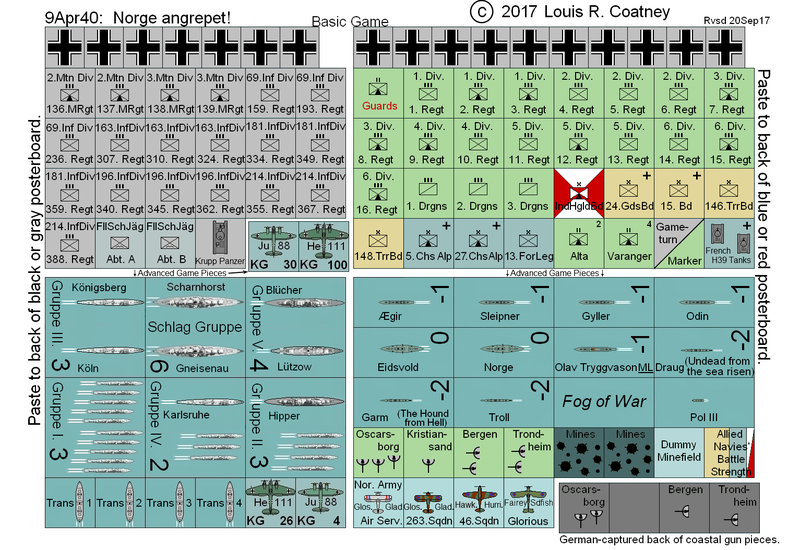 Revised 16Oct17 - note victory condition modification for Narvik - and expect more revisions. DRAFT. Mapsheet, cleaner without Game-turn Sequence on it. 9Apr40: Norge angrepet! mapsheet, with no Game-turn Sequence. Print this off onto an 11x17/A3 size sheet. Rvsd - additional mountains - 28Sep17. 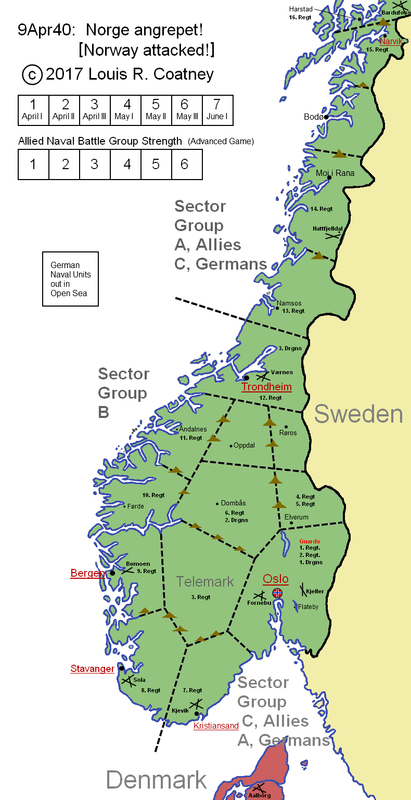 9Apr40: Norge angrepet! mapsheet - northern third, with no Game-turn Sequence. Print this off onto an 8.5x11/A4 or 11x17/A3 size sheet for a larger map. Rvsd 20Sep17. 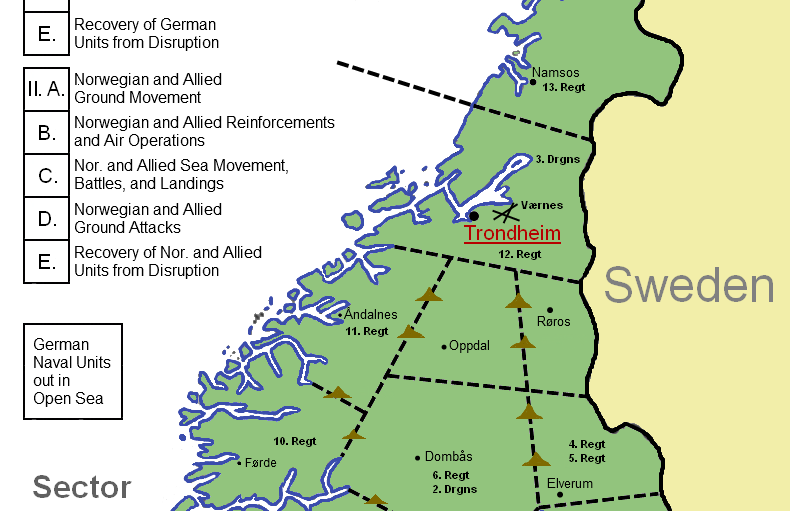 9Apr40: Norge angrepet! mapsheet - center third, with no Game-turn Sequence. Print this off onto an 8.5x11/A4 or 11x17/A3 size sheet for a larger map. Rvsd 20Sep17. 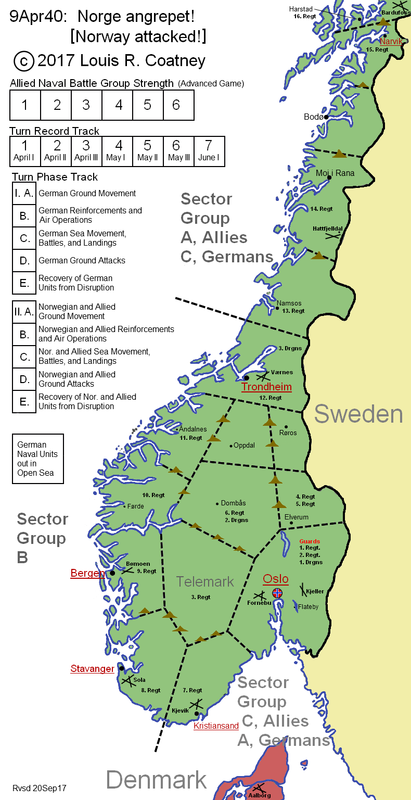 9Apr40: Norge angrepet! mapsheet - southern third, with no Game-turn Sequence. Print this off onto an 8.5x11/A4 or 11x17/A3 size sheet for a larger map. Rvsd 20Sep17. Mapsheet with Game-turn Sequence on it. 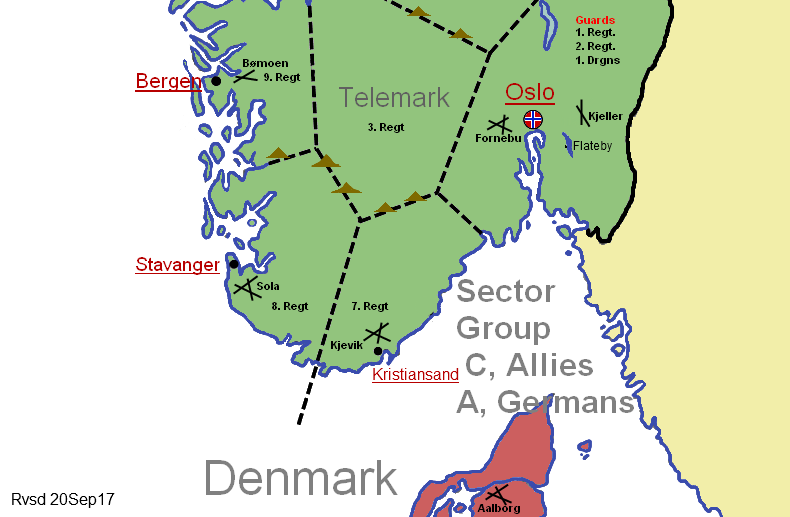 9Apr40: Norge angrepet! mapsheet, with Game-turn Sequence on it. Print this off onto an 11x17/A3 size sheet. Rvsd - additional mountains - 20Sep17. 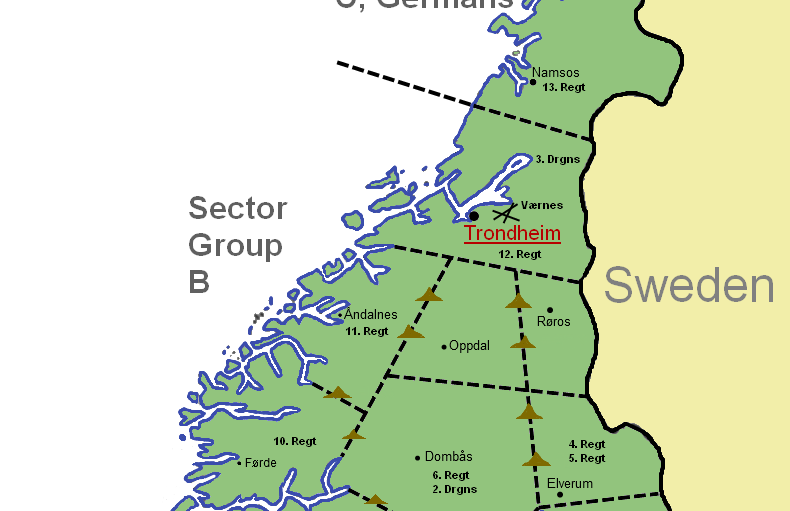 9Apr40: Norge angrepet! mapsheet - northern third, with Game-turn Sequence. Print this off onto an 8.5x11/A4 or 11x17/A3 size sheet for a larger map. Rvsd 20Sep17. 9Apr40: Norge angrepet! mapsheet - center third, with Game-turn Sequence. 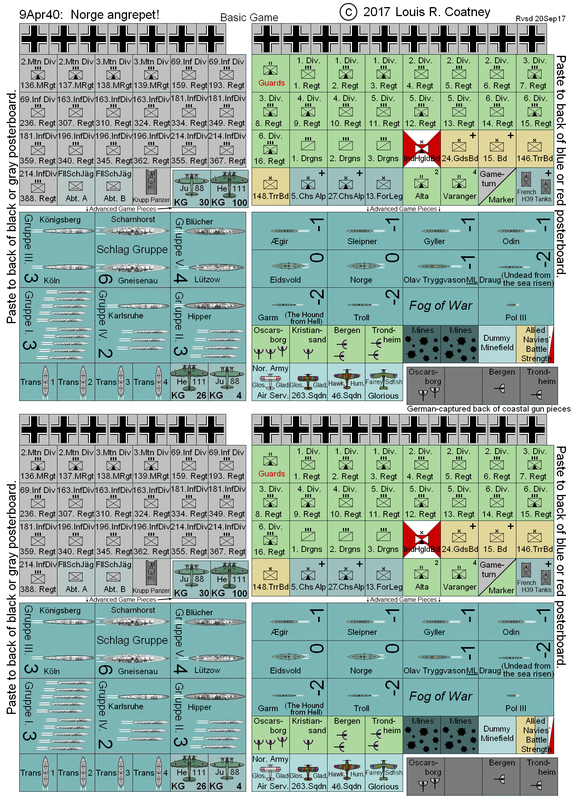 Print this off onto an 8.5x11/A4 or 11x17/A3 size sheet for a larger map. Rvsd 20Sep17. 9Apr40: Norge angrepet! mapsheet - southern third of map version with Game-turn Sequence. Print this off onto an 8.5x11/A4 or 11x17/A3 size sheet for a larger map. Rvsd 20Sep17. 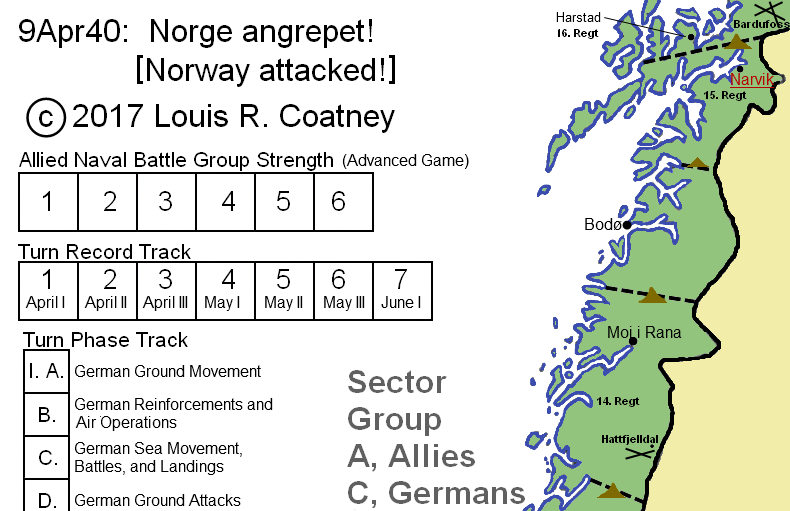 9Apr40: Norge angrepet! 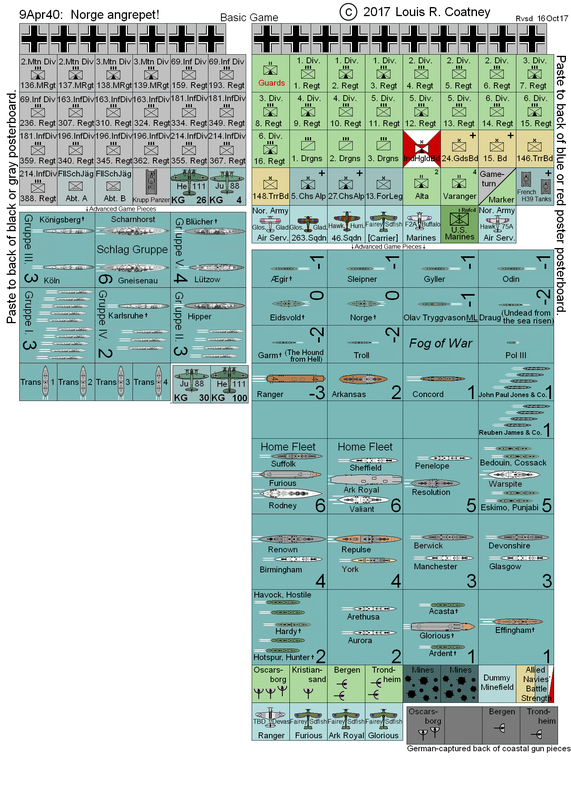 units, with British naval units - USE THIS FIRST. Print off onto an 8.5x11/A4 size sheet for small pieces - 11x17/A3 size for large pieces. Rvsd 16Oct17. 9Apr40: Norge angrepet! units. Print off onto an 8.5x11/A4 size sheet. Rvsd 20Sep17. 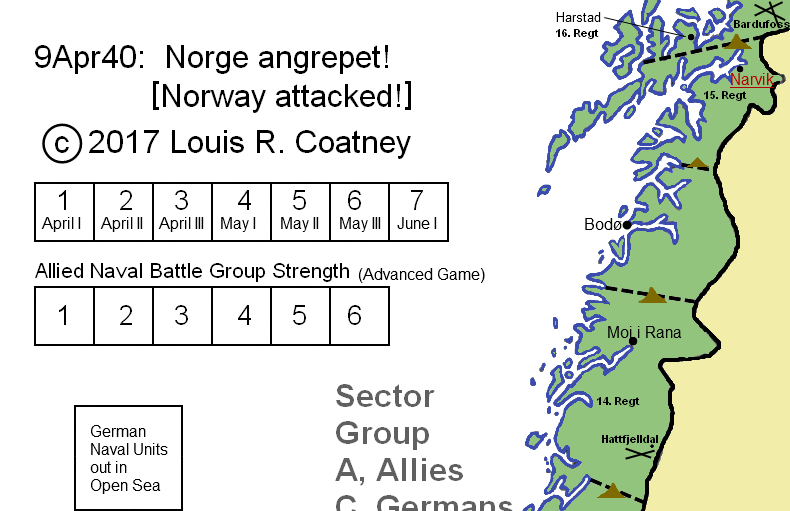 9Apr40: Norge angrepet! units - 1 large copy. Print off onto an 8.5x11/A4 size sheet. Rvsd 20Sep17.